"In that case, however, the admixture is more ancient, and ... the blend has been completed, and most individuals have similar admixture proportions from the ancestral groups". I strongly suspect that all races are the result of such admixture. During my study of duck evolution I've certainly come to the conclusion that admixture has been widespread, and a major contributor to duck variation. I would guess that migration and admixture has also been important during human evolution, right back to Homo erectus times, or even earlier. In other words we don't all descend from just a single relatively recent migration out of Africa. Africans may have contributed most of the modern human genes, or mostly African genes may survive, but I would assume, until absolutely proved otherwise, that pre-existing populations also contributed. It's not yet certain that we'll see clearly seperated "biological races" when finer scale samples are collected from around the world. Recent admixture will definitely play a major role in bridging the gaps between the major continental clusters, but many samples of unmixed popuations will do the same IMO. In the end, it'll be a mess, with very uneven distributions, sometimes with blurs and sometimes not. Drawing up neat racial categories will be a headache, but yes, picking out major relative breeding isolates will be fairly easy nontheless. "many samples of unmixed popuations will do the same". OK. Just one example of an unmixed population? I agree we will see "major relative breeding isolates", but with the accent on "relative". The "black race" to which African Americans are said to belong is seen as an almost perfect linear combination of Caucasoids and Negroids. It appears linear until the African component no longer dominates, at which point perhaps some American Indian contribution may explain the scatter. I wonder if you sampled Whites in the south if you'd be able to get a continuous line. In the past if you were Black and could reasonably pass as White you could move to a new town and no one would be the wiser. Why have the Chinese and Japanese HapMap samples not cleanly separated (who have a Fst of about 0.007 IIRC) with 600k SNPs if there would be, as Polak implies, a drastically different situation on the graph if samples from all European countries were present, where, IIRC, the highest value between them was about 0.006 (S-W Spaniards v. N-E Russians? ), whereas the Fst between Yorubas and the CEU sample is 0.16 according to the study. Of course, mere Fst distances do not capture the totality of genetic information and ignore the underlying genetic structure. It looks like a pretty decent comparison of the three races. "at which point perhaps some American Indian contribution may explain the scatter". I've been interested in blues music for many years and one thing I've noticed: many of the early blues singers looked as though they had Indigenous American genes. Conversely I noticed when I met Cherokees in Arkansas many of them looked as though they had African genes. They claimed Cherokees had looked that way long before the White Man got to America. I suppose it is remotely possible that it's true. I'm doing an experiment with comment posting, and I'd like this blog to participate. Send your blog comments to http://acommentpost.blogspot.com or click below to visit the page. Feel free to dump your comments from your blog there, post as many times as you like, repeat comments, etc. It does not matter. FREE SPEECH ZONE AHEAD! Consider it a dump for comment posts. This will be an interesting experiment. "Why have the Chinese and Japanese HapMap samples not cleanly separated..."
Actually, the Chinese and Japanese samples do separate, just using other eigenvectors. These graphs are just projections of individuals onto the principle component space (which is derived from genome-wide SNP data), and so there are many, many more dimensions to look at. The first two are typically sufficient to separate the major biological races from one another, but if you look at the other components, you will find some that spread out the individual groups. Similarly, if you repeat the experiment with just Mongoloid samples, the major axes (i.e. 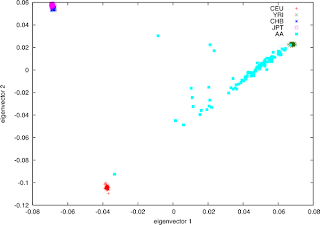 the first couple of eigenvectors) will differentiate the different subtypes. "... if there would be, as Polak implies, a drastically different situation on the graph if samples from all European countries were present"
So would not more European samples largely just overlap around one another on the graph aswell, creating at best a 3x bigger blob, when using the first two principal components?